What a lovely location! 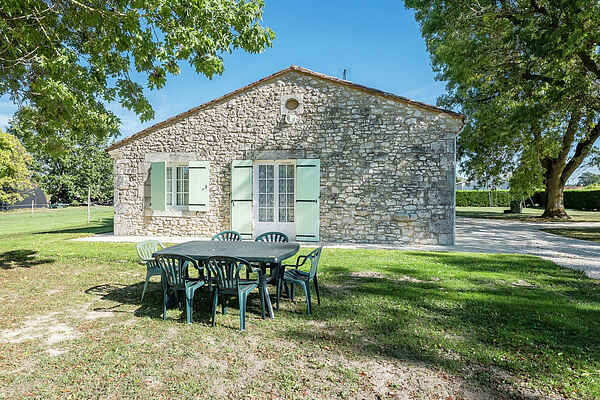 This holiday home is right in the middle of nature in Bergerac (8 km). Enjoy the magnificent view of the beautiful vineyards at Château de Monbazillac from your garden. This holiday home used to be a farmhouse (2 under 1 roof). The large shared terrain is partially planted with corn, sunflowers and vines. For the kids there is a sandbox and a playset. The house is very comfortably decorated and fully equipped. The living room has an antique cabinet and a beautiful dining area. There is a modern built-in kitchen. Although the house is very rural, there are many things to do in the immediate area. Bergerac, as in Cyrano, is a place full of cultural attractions. There's lots of fun to be had with shopping or active pursuits. There is a water park and you can canoe on the Dordogne. Looking for a recreational lake? You will find one at Lanquais (16 km), where you can swim, surf and hire a paddle boat. There's a golf course at Mouleydier (13 km). Other must-sees are the historical villages of Monpazier (46 km), Castillonnès (24 km) and Villeréal (32 km). There's also a golf course at Le Vigier (33 km). Your house is the so-called type 'two-under-one-roof. '; Your left neighbor (rechtsop the picture), the FR-24520-10. Note: You will receive a 10% discount if you are FR-24520-10 and FR-24520-09 are renting together.